Summer is here and the sun is well and truly shining in London! Whether you’ve got an exciting trip abroad on the horizon or are planning on making the most of this UK heatwave, you need to take extra care of your skin, particularly on your face. In the Summer, increased temperatures and glaring sunshine can wreak absolute havoc on your skin, causing dryness, irritation and if you’re not prepared, the dreaded ‘burning’. Summer is typically when our skin takes the biggest hit in terms of ageing and if you aren’t layered up with some form of SPF (sun protection factor) you are sure to pay the ultimate price. 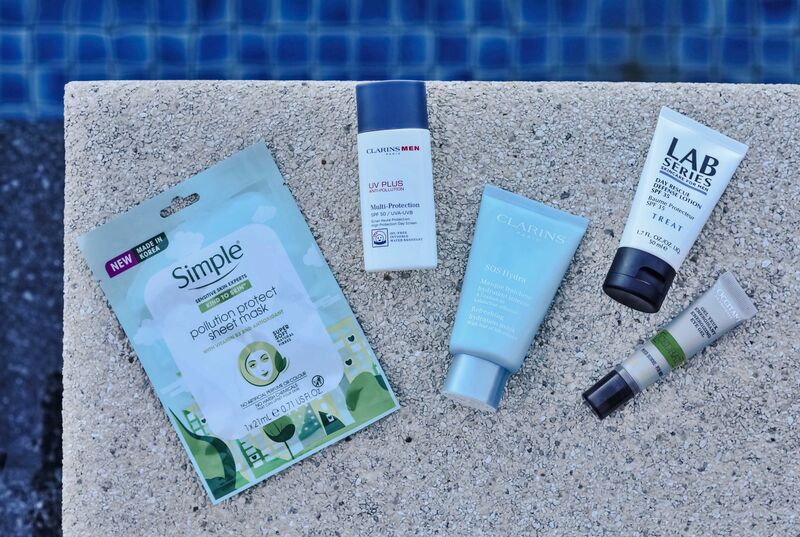 Here are a few of my stand-out favourites, guaranteed to keep your skin safe and looking fresh throughout the warmer months! It’s now common knowledge that too much sun can do some major long-term damage to your skin (and of course your health). Aside from hiding inside or wearing hideous headwear (!) the best way to protect yourself is with a decent SPF moisturiser. 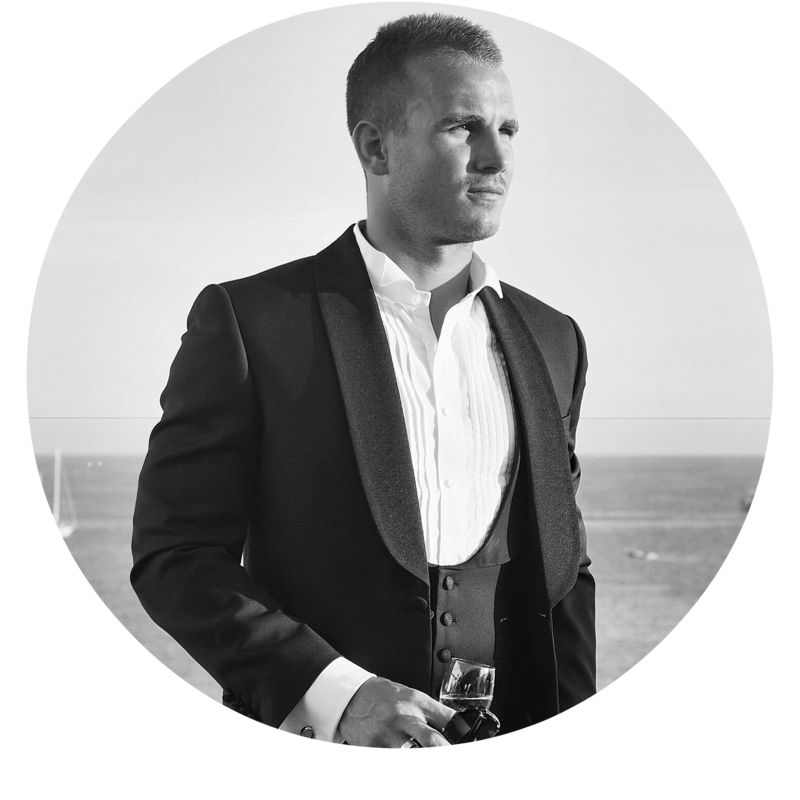 SPF skincare is the talk of the town at the moment and it important us guys take note. Ignoring SPF is a dangerous game with long-term effects including serious ageing, something I’d imagine we are all very keen to avoid! 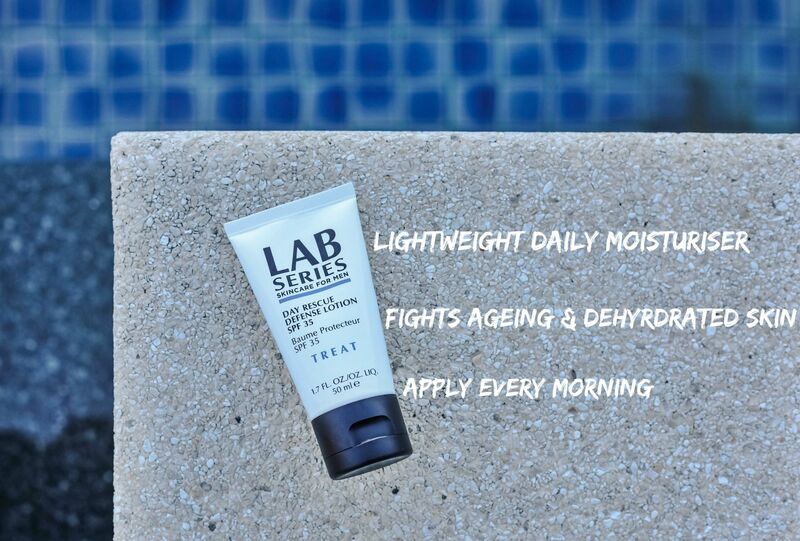 The Day Rescue Defense Lotion from my faves at LAB Series is a cracking everyday moisturiser packed with SPF 35 to keep you protected from those harmful rays. It’s lightweight and absorbs quickly so it won’t clog up your skin and is well-suited to warmer days when it’s likely your skin might be oilier than usual. I tend to apply this after my morning shower and then take with me for a top up if needed. *Added Bonus – Great for city breaks or weekend getaways where you are on a dreaded ‘liquids limit’ as it’s only 50ml and essentially does two jobs; moisturises & protects! Shop Day Rescue Defense by LAB Series here. For the hottest and driest of days you’ll need to bring in the big guns and stump for a higher SPF (around the 50 mark) for an added barrier of protection. 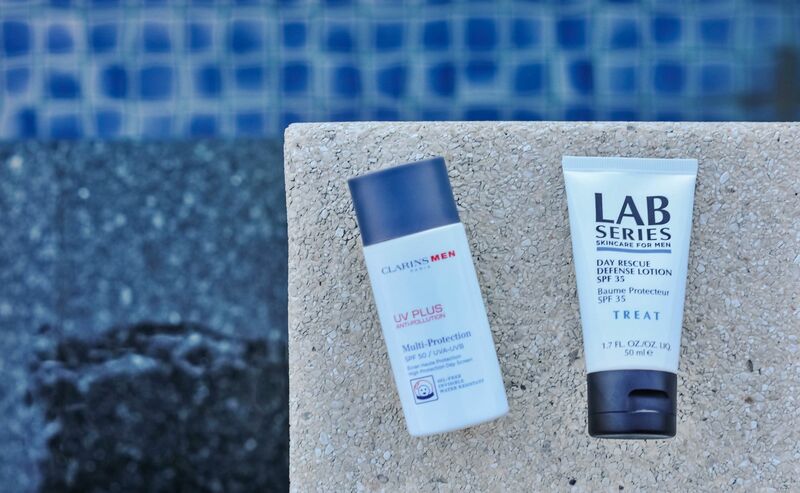 UV Plus by Clarins Men has fast become my ‘go-to’ for these situations and is ideal for applying to those particularly susceptible areas on your face that tend to burn more easily (forehead, nose, ears). It’s more of a lotion than a cream, but the ideal final layer of protection against those harmful rays and is oil-free which is of course great news for all of out there with oily skin. *Added Bonus – Whether you’re swimming, surfing or just sweating (!) 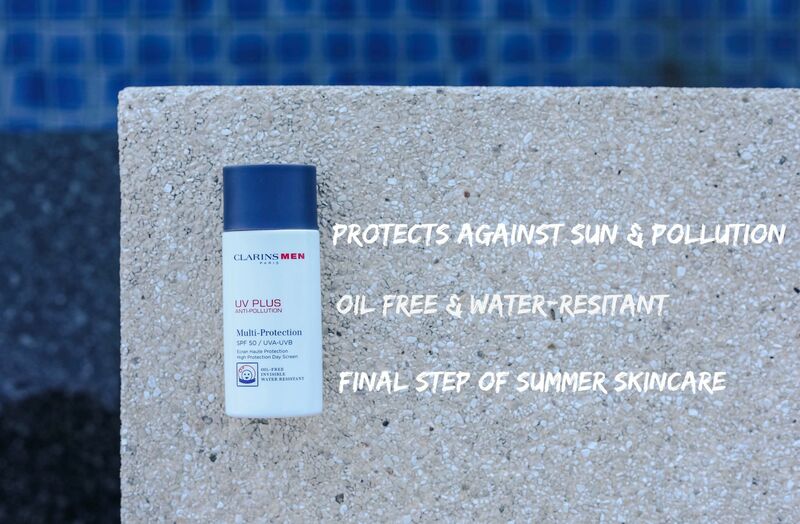 sun cream can often wash off and leave you exposed to the sun’s rays – UV plus will keep you protected during the times as it’s exceptionally water-resistant and fast absorbing. Shop UV Plus by Clarins Men here. In the Summer, your skin is exposed to harsh conditions. Sun, sand, wind, salt water… all of these factors can damage and irritate the skin. The solution… hydrate, hydrate, hydrate – caring for your skin after a day in the sunshine is all about hydration and ultimately re-hydrating your skin’s cells. Upping your water intake on hotter days is fairly obvious and can massively help your skin but there are some cracking products out there to use in those hours after sun-exposure to ensure your skin repairs and recovers. Don’t underestimate the importance of ‘after-sun’ and caring for your skin after a day exposed to the rays! Those hours after a day sunbathing are crucial and the perfect time to reach for a sheet mask to help your skin’s regeneration and bring the moisture back. 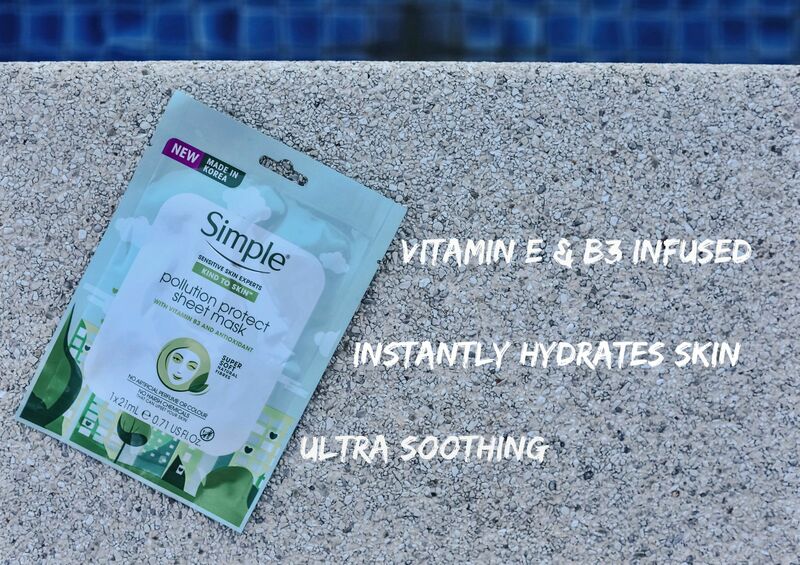 This pollution protect sheet mask from Simple is a current go-to, enriched with vitamins E and B3, instantly hydrating the skin and fighting the effects of pollution. Sheet masks are a favourite of mine, less messy than some of the hydration masks on offer, easy to pack for a trip abroad and they really boost the skin. I also like to use these before a special night out or more importantly the morning after a very late (and messy) night! 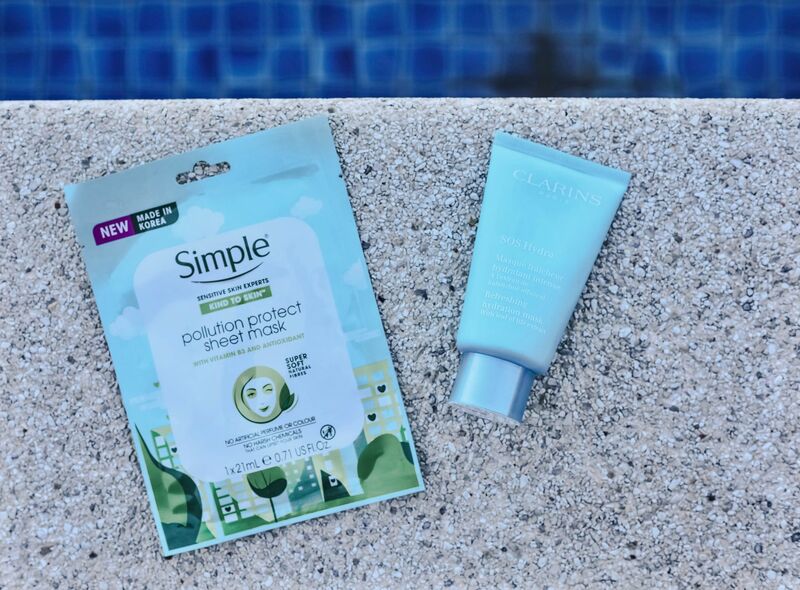 Shop the Pollution Protection Mask by Simple Skin here. It’s no secret that Clarins is one of my all-time favourite brands and this product is one of my hero’s of the past few years. Aptly named, this little fella has come to the rescue a number of times when my skin has been crying out for hydration and on the edge of the dreaded ‘peeling’. Whenever I’m on holiday I like to stick a thin layer of this on before bed to give my skin a much needed boost and to re-hydrate after a day of sun-seeking. 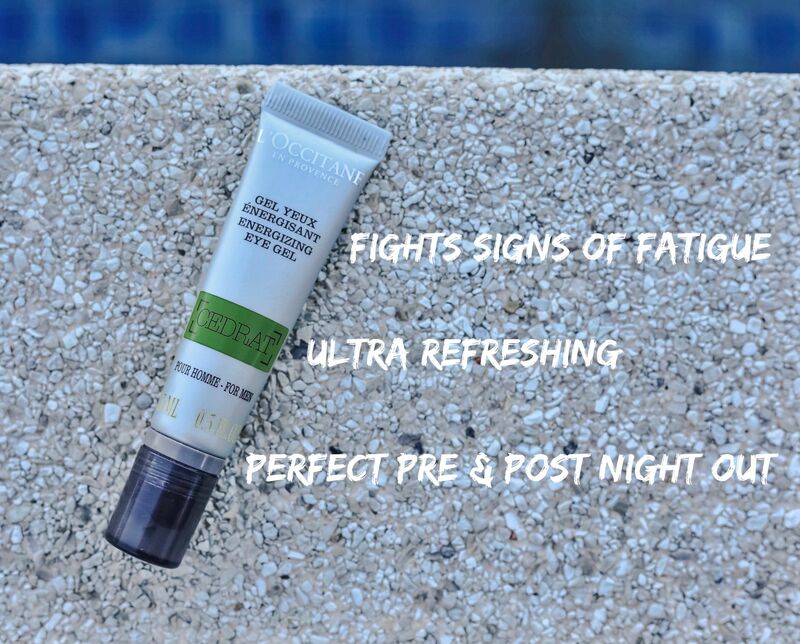 *Added Bonus – Ideal for fighting sunburn if you’re looking a little ‘rouge’ and also great after a long-haul flight to fight that tired looking skin! 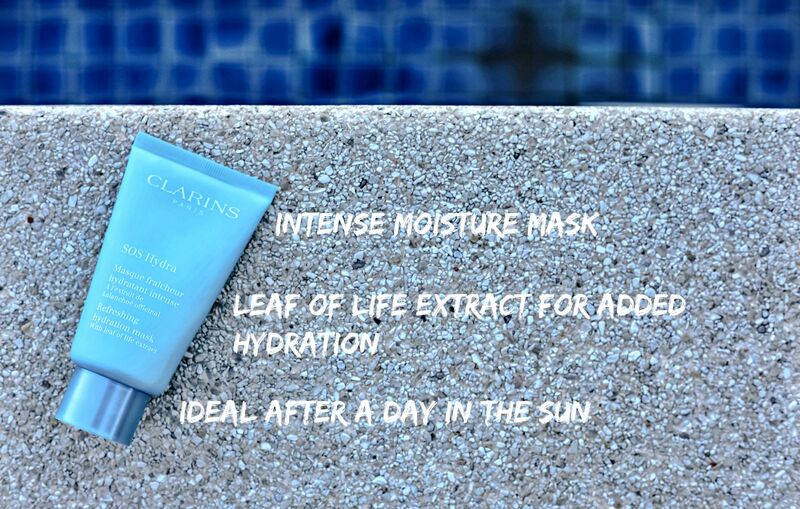 Shop SOS Hydra by Clarins here. If there’s one area of your skin you choose to focus your attention on this Summer, make it your eyes. They are the biggest betrayer of age and poor health choices and with all those afternoons spent in the sunny pub gardens, it’s an area that will likely need a big helping hand. Dehydration and lack of sleep are two big causes of the dreaded ‘eye bags’ and the best way to avoid that hungover, fatigued look, is using a eye gel or cream designed to fight those bags. There is a wide array of products available that have been specifically designed for us chaps and many do a cracking job, but a stand out favourite of mine is Gel Yeux from the French masters at L’Occitane. It’s a gel as opposed to a cream, helps tighten those under eye areas whilst also hydrating and is dead easy to apply with the metal roller balls, much less mess than these pots of eye cream by other brands. *Added Bonus – It’s only 50ml and a great shape to squeeze into that ‘plastic bag’ for Weekend getaways. Also good value at £24.00, mine lasted for a solid 3 months! Shop Gel Yeux by L’Occitane here. In addition to making the most of the amazing products now available for us guys this Summer, be sure to drink loads of water and try and steer clear of air-conditioning when possible, your skin will reap the benefits. Where are you all headed this Summer?